I wouldn’t say I was a ever a fan of “Agadoo”. But I danced to it – like “The Birdie Song” and Russ Abbot’s “Atmosphere” it was played at school discos when I was 12 or 13, to entertain the segment who were there to jump around and didn’t care about girls. I saw Black Lace as quite harmless, a thing apart from the rest of pop and not really to be judged on its terms: they were the soundtrack to marshmallow eating contests and birthday congas, nothing more. So in a way “The Chicken Song” taught me to hate them. Because “The Chicken Song” was something more: it was satire. Not only that, the B-Side was political satire. Actually, I’m not even sure “I’ve Never Met A Nice South African” qualifies as satire – it’s just sheer nastiness and all the more effective for that. It uncovers the secret of Spitting Image – the show was all about dehumanisation: the reduction of the famous to latex tics was also a way of creating the distance needed to really lay into them. “South African” worked because it was dehumanising the dehumanisers, damning a proud and prejudiced culture as a stinking, rubber-faced joke. Unfortunately, it was only the B-Side, and the A-Side dealt far less well with a far less worthy target. Not that I thought so at the time: I loved “The Chicken Song”. But I was wrong: it’s asking you to make a straight comparison between a record which, however dreadful, is designed to help people enjoy themselves, or a record which is designed to sneer at people enjoying themselves. Which “The Chicken Song” does, very effectively: I don’t know who sang it but his voice is a black hole of disdain. Ah, you might say, but the problem with Black Lace and their Roadshow-fodder ilk is that they were a kind of enforced fun. If you weren’t joining in you could be seen as a killjoy. And this is a good point. I would counter that if you had the good luck to be a student in the 80s or 90s the kind of tupenny-ha’penny ‘surrealism’ peddled by “The Chicken Song” was far more grindingly inescapable and orthodox than any pineapple-pushing heartiness, and makes it exhausting to hear now. And I’d add the very obvious point that Spitting Image are destroying the charts in order to save them – all that happened was “The Chicken Song” found its way onto disco playlists and people had the same kind of inane fun they were having before, only now with added air quotes. As Nietzsche said, battle not with funsters lest ye become a funster. For some reason I have a 45 of Black Lace’s “I Speaka Da Lingo” which I assume I must have bought in a fit of studenty ironic japery. I think it made me laugh more than this did though, and I loved the TV show. So who actually sung this song then? Some people above are saying Philip Pope, but all the information I can find has him as composer / producer rather than singer. The only actual claim I can find on the internet is this – http://www.inthenews.co.uk/comment/entertainment/tv/interview-remembering-spitting-image-$1338336.htm – in which the singer is named as one Kate Robbins. But it really doesn’t sound like a woman to me. Anyone have any better evidence? Spitting Image was always very ropey as I recall – I’d feel I’d seen a good episode if it had two good gags. More likely it would have an excellent opening skit followed by an entire show of filler. I speak as a (pre) teenager though – I suspect the show pitched itself differently at different audiences and that others will have got more out of it. Even so, as a kid I felt caught between two versions of what it imagined its audience to be, so that the wordy stuff was usually too obvious and the puerile stuff just plain not funny. I was always happiest to note some minor gag going on off-centre, which at least speaks of attention to detail. Probably I was just oblivious to much of it – it seems like the kind of show that’d lend itself to the kind of public-school-type humour for which I would be no ready audience. I’m amazed it aired at all outside the UK, to be honest. I’ve seen a French version of the idea and had not one clue what was going on, who the characters were, or even which bits were the jokes (and my French is pretty good, it’s a cultural reference problem). Even the British characters didn’t necessarily translate, at least to me – although, like the single, the show did accord a sort of cachet to those it sought to lampoon. I still would have little idea who John Selwyn Gummer was, for example, had I not frequently passed his house in Queen Anne’s Gate to see his puppet on display in his front window. At least I think that’s his house – it’s a bit try-hard, whoever it is. The idea was revived with a fanfare about two years ago, with computer animation rather than puppets – which did seem to be missing the point rather. I presume that version sank without trace. Absolutely loved it at the time. I remember Smash Hits doing an illustrated lyric page with which I did an evening’s work of memorising the chorus for later bellowing in the playground. We’d do Snooker Loopy as a encore. I have no desire to hear either now. TOTPWatch. 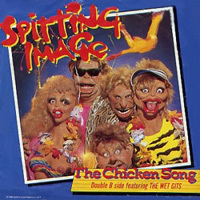 Spitting Image performed The Chicken Song on the Top Of The Pops of May 22 1986. I remember that as being a cumbersome appearance, featuring Ronald Reagan on drums. Also in the studio that week were; Jaki Graham, Billy Ocean and Simply Red. Peter Powell was the host. re37 that sounds like one of the dullest TOTP line-ups ever – with PP the tasteless icing on the cake. That reminds me that for some reason he was championing an up and coming b(l)and (possibly called Rouen – but I may be wrong) and appeared at a gig they did at the University of London Institute of Education Student Union some time in 1986 – which in turn triggers memories of seeing Sonic Youth being photographed for the NME just outside the building on another day. Re 35: I remember the French version being little more than a non-satirical, gentle jog around the French political scene with only the puppets as a common link. Don’t recall Le Pen at all. I always watched SI (wonder if that was intentional?) but often felt it was too Steve Bell-ish in its heaviness of touch. D Steele as a pocket-size figure – great! Douglas Hurd’s 99 flake hair – great! But not at all consistent. Having said THAT I don’t think for a minute that if it was a brand new idea anyone would broadcast it in 2009. There was talk of the show returning to ITV a few years ago (strangely around the same time of satirical animation sketch show 2DTV) but this seems to have come to nothing. If it had I wonder how many of the original puppets could’ve been re-used. It’s weird to think that it was actually still going right up until the arrival of Tony Blair (initially they portrayed him as a hyperactive schoolboy but only after he became the new Labour leader did they add the super wide smile iirc). Perhaps he was the one of the last puppets to have been made. SI didn’t always hit their targets dead on, but as it became more news-driven and writers had to script on the hoof, it had a freshness of feel for a while at least. Thatcher’s voice was by Steve Nallon (as was Major’s) and I think it’s that vocal caricature that endures in my mind more so than Janet Brown’s which was, at the time heralded as the definitive Thatcher Impersonation. Nallon could absolutely turn soft tones (used particularly effectively when Thatcher was being patronising) into a harsh guttral roar (used when bollocking her cabinet) at the drop of a hat. Skinhead Tebbit in his biker jacket stroking a cosh was pretty much bang on as well. Lord, imagine the “fun” they could have had with George W. Bush. Funnily enough, I always think of Chas & Dave’s ‘Margate’ whenever I pass through Moorgate. the rather unpleasant and unfortunately not uncommon sound of middle class often Oxbridge educated members of the alternative comedy “establishment” taking the piss out of the working class rather ironic when I should imagine most of them liked to identify with the left. this was the second single i bought (i never much got the single-buying habit though and i’m pretty sure the next 7″ i bought after this was pavement’s “trigger cut”) and we all thought it was hilarious at the time. in retrospect it is unpleasantly sneery (the involvement of the loathsome r mcgrath would make absolute sense) but i’m pretty sure that nearly everyone buying it did get the joke, and unlike, say, frank zappa’s “satires” it does at least have the grace to be as good at the thing it is sneering at*. i think the b side lasted a bit longer in our affections and i remember trying but failing to cause an outrage by playing it in the ‘bring in a song’ bit of a school music lesson. actually, we all had to note down and give a score to whatever was played each lesson in our music books – i’d love to see this now as a bit of cultural history. the other record i remember taking in was queen’s ‘stone cold crazy’. this received much awestruck praise for how fast freddie was singing iirc. I reached a similar view on Zappa after equally brief exposure to him: a version of ‘Stairway To Heaven’ where a horn section plays the guitar solo note-for-note; and John Lennon doing ‘Well’ with the Mothers of Invention, where beforehand Zappa tells the crowd to ‘cool it you guys’ and they do. I would normally admire those kinds of confidence, but (as you say) there’s something that goes beyond into sneery territory – on the latter clip he comes across less leader-of-the-gang, and more like a humourless Fonzie. If I am not busy at the weekend, I may attempt a critique of Spitting Image thru the radical lens of my old pal-foe B.Watson’s Adornoid reading of Zappa. LUCKILY FOR ALL OF YOU I AM VERY LIKELY TO BE BUSY AT THE WEEKEND. “We used to be on LSD! Now we’re in the SDP! My opinion on Frank Zappa was formed while on a five hour drive across Florida with a Zappa nut and having to listen to several of his albums. Unfortunately it wasn’t my car so I had no choice in the musical selection. Believe me, your first impression was right, he’s bloody awful. By the time we got to Miami I wanted to rip my own ears off. Zappa was the most Marmite of artists. Either inspiring love or hate. My Dad brought home a Zappa album after one of his “lost weekends”, where he would end up round a friends house smoking dope and watching Cheech and Chong videos. The album in question was “Sheikh Yabouti” which really only had 2 memorable tracks on it. One was “Dancing Fool” and the other was “Broken Hearts Are For Assholes”. I got the feeling that Mr Zappa was a cynical old misogynist who should take a good long hard look in the mirror. The same could be said for my Dad at the time. #48 – Andy, I have to take issue with you a little concerning “middle class Oxbridge educated” types taking the piss out of the working class. What about those members of the working class who hated “Agadoo” and the like as well? – there must have been a significant number of those buying the record, not thinking they were having the piss taken out of them but enjoying the pisstake of an irritating record. As I write this I’m thinking of the scene in “Educating Rita” – by Willy Russell, no middle-class type himself – where Rita’s family is singing along to a Black Lace-type song in the pub and her mother moans “there must be better songs to sing”. Not everybody buying the Chicken Song will have had aspirations to an Open University degree, granted, but what you’re saying still seems “classist” in itself. Having been subjected to mass breakouts of dancing to Agadoo, the Birdie Song etc as I was preparing to leave the nest (ha!) I enjoyed the Chicken Song and still do from time to time. It’s the inventiveness of the “instructions” (e.g. form a string quartet and pretend your name is Keith) which makes it listenable more than a couple of times, and although I wouldn’t defend it as a great record, it’s better than the average comedy hit. These were politically fraught times which brought about harsh responses in comedy, which is why Spitting Image was so vituperative during the high summer of Thatcherism. It was also around this time that “When Saturday Comes” and “Off The Ball” were launched, the harsh Private Eye-style response to the state of football at the time. It became received wisdom that Spitting Image’s puppets were of a rather higher quality than their scripts, and a lot of the time this was true. Nevertheless the final series included some of its sharpest material: Major and Lamont as layabout workers who greet every enquiry as to when the recession will end with a dismissive “Dunno mate”; and the advent of New Labour. I remember the original Fluck and Law maquettes from the sunday glossies long before the show started, and looked on wikipedia to fnd a little more about F&L, then and now. Very thin etry — somehow they’ve fallen out of (internet-generated) history — except that, to my baffled delight, Roger Law has (apparently) moved to China, to the legendary Jingdhezen*, the “porcelain city”, were he makes ceramics! *This place pops up in my day job fairly often, as the craft of ceramics is a regular feature. #55: those Prescott ideas absolutely scream ‘missed opportunity’. Why did Spitting Image eventually fail? It can’t have been for want of material* – think what you could do with a Vladimir Putin puppet. The only reasons I can think of are bad writing, and the rise of the much sharper Have I Got News For You?. Or maybe it just got old – but then there’s always some kind of political satire thing kicking around to some kind of acclaim, even if it’s really poor like the political bits of Mock The Week. * that said, I do remember reading that the ill-fated recent computer-animated revival deliberately cut out Jack Straw for fear that the audience wouldn’t know who he is. That’s a shocking lack of faith in the medium right there. Are HIGNFY, mock the week etc sharper than spitting image, or just cheaper? But there’s a definite backlash underway against “edgy” humour – Mock the Week v Rebecca Adlington, Jimmy Carr on injured soldiers and of course Sachsgate being cases where they’ve gone a step too far. And it’s curious to note how some of the arguments in defence of those cases could have been made for Bernard Manning in the 70s. BTW Punctum #9 – “the majority of British people were about to want [Thatcherism] for the third time” – not quite. The Tories got, as I recall, some 60% of the seats in 1987 with 42% of the vote; and with a turnout around 70% that means that fewer than three people in ten who could have voted for them did so. Still more than any other party of course, but not a majority of us – it rarely if ever is. Jimmy Carr absolutely didn’t go a step too far. The backlash came from professional offendees only. The actual targets of the joke no doubt go in for exactly that sort of humour among themselves. Not that the soldiers actually were the targets, of course – the whole thing is exactly what political humour should be about, and I’m delighted that Carr came out fighting. Edit: I’m not getting at you, I know you were only noting the backlash – it’s just that the whole cheapening of debate and the elevation of ‘offence’ to the worst of crimes really gets to me. Comedy may not be a very important manifestation of it, but the same process threatens sensible treatment of other public issues and that is important. Such is fertile soil for ‘edgy’ humour in future, I guess, so maybe the rest of them will have to sharpen their acts up. Thanks for saying that Izzy, and no I didn’t take it personally. Listening to the debate on the radio between a Carr fan and the mother of a maimed soldier, I could see elements of both viewpoints. As someone was quick to point out, that gag is just the kind of one soldiers would make amongst themselves (my dad was in Italy at the end of WW2 and told me some gags I’d hesitate to reproduce here), but maybe the point is that as a non-soldier Carr wasn’t entitled to tell it himself – is it analogous to a white comic telling gags black comics can tell about black people, or is that a dangerous route to go down? I hear what you say about professional offendees too. It’s noticeable how when this sort of thing arises the media know exactly who to contact for an outraged response. Similar to the fuss the other week about £47m being paid in bonuses to MoD staff – it’s just part of the kind of pay package that thousands in the public sector are on, but it’s easy to contact bereaved families, spin it as outrageous and exploit their grief for the sake of a two-day story. Can you not imagine a point, though, at which you yourself would say someone has gone too far? I enjoyed Billy Connolly for years, give or take a Lotto ad or two, but the Ken Bigley joke was hard to stomach. Funny you should mention that: I was actually at the Apollo the night of the Ken Bigley joke (one of about four comedy gigs I’ve ever been to) and feel Connolly’s been misrepresented. As I recall it, the immediate context was what bastards the kidnappers were for putting him through the ordeal of pleading for his life every night, as if they were ever going to let him go. i.e. ‘just put him out of his misery’ rather than ‘come on, don’t make us wait’. It’s a really risky line to go down and I totally understand why he got pilloried – I suspect principally because at least part of the public was equally strung along into getting its hopes up every time a new video appeared – but it wasn’t the malicious one that got reported. As things panned out, it was even arguably right on point. You’re right, that is a subtly different spin on it, and one which might have eased the public outrage which ensued (I think the execution happened within 48 hours of the controversy over the joke, didn’t it?) Connolly didn’t seem to be trying too hard to defend himself, though (perhaps he was weary of dealing with the press), and his career did seem to take a knock. I’d call it a ‘murder’ rather than an ‘execution’ myself. The stuff you say at #62 is an education in how the media works. Not just offendees but all sorts of pressure groups influence the way a story is reported. I’m not sure it’s the media pushing it all the time, I think the pressure groups are feeding these stories a lot of the time. I think you see this particularly with a scrupulous organ like the BBC which tries hard not to impose a narrative of its own, but ends up having its context set for it by whoever has the loudest mouth bellowing in its ear. I saw this myself when something I’d been working on hit the BBC website during the week – there was an accurate story with the unadorned facts for the first couple of hours after the story broke, but thereafter the context got filled up by interest groups getting their quotes in, until by the end of the day you can get something quite distorted. That didn’t actually happen too badly this time around because there were voices on both sides, but on a previous occasion only one side were interested in lobbying for coverage, with the result that the story did a full 180° during the course of the day – what had started as a victory for one side ended the day being reported as a victory for the other! well actually, I just meant cheaper to make, but interesting subsequent debate…My thought was that HIGNFY-style ‘quiz’ shows are the comedic equivalent of reality TV, an interesting idea to begin with that becomes ubiquitous, lazy programming (according to which analogy HIGNFY is the original Castaway, and Argumental is something like Celebrity Love Island). You don’t have to spend months making puppets and thinking up songs that may or may not fall flat. I saw Prezza retweeting it the other day so did the same (er, not that i RT everything he does).